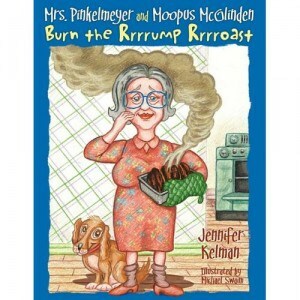 Mrs. Pinkelmeyer and Moopus McGlinden Burn the Rrrrump Rrrroast by Jennifer Kelman is the first in a new series of books based on the Mrs. Pinkelmeyer and her beloved dog Moopus McGlinden characters. I wasn’t sure that my little ones would quite understand the moral of the story which centers on a little boy named Henry in New York City who is sad and missing his parents while they are gone and he is being cared for by his Aunt. They surprised me….they did get it and along the way, they also had numerous laughs at the antics of Mrs. Pinkelmeyer and Moopus McGlinden who live across the Atlantic from the mysterious little boy and his Aunt who have called her while she is cooking her “Rrrrump Rrroast.” By the end of the story my children were chiming in and rolling their “R’s” along with the Mrs. Pinkelmeyer. The illustrations by Michael Swaim are delightful and add a real charm to the story. I tried reading it with the accent and I think my kids thought I had lost my mind but they did seem to enjoy my efforts. This book is perfect for children who are facing the emotions of separation of a loved one. It would also be a really great book for teachers of young children to help with the transition to a new school year. It is a warm tale that my children and I both enjoyed. I am confident there were be more adventures with Mrs. Pinkelmeyer and the adorable Moopus McGlinden. Thank you so much for such a wonderful review. It warms my heart to know that others are finding enjoyment from Mrs. Pinkelmeyer and Moopus McGlinden. Book#2 in the works…stay tuned for more silliness.